Faith is the gift of God to his people. In baptism the Lord is adding to our number those whom he is calling. People of God, will you welcome these candidates and uphold them in their new life in Christ? At Emmanuel we gladly baptise new members of whatever age into the family of God, praying for them as they embark on their exciting journey and pilgrimage of faith. There is no age limit for baptism, but it is something which can only happen once in our lifetimes, either in infancy or later on in life, if one has not been baptised as an infant. Later on, either as an older child, teenager or an adult, our baptismal promises can be joyfully and confidently reaffirmed in the sacrament of Confirmation. Sometimes people are confused about the terms “baptism” and “christening”. They actually refer to the same liturgy of initiation into the life of the Church as Christ’s body throughout the world and down the ages, with “baptism” being the more ancient and ecumenical term. Baptisms take place at the font, which by ancient custom is placed quite deliberately near the main door of the Church, since it is not only the place of new-birth and new-life, but also the beginning of our pilgrimage in and with God, continuing on into all eternity. The baptistry at Emmanuel is illuminated by three beautiful stained glass window dating from 1904, depicting Noah giving thanks to God after the flood, the people of Israel passing through the waters of the red sea in the liberation of the Exodus and Jesus being baptised by John the Baptist in the river Jordan. Beside the font stands the Paschal (Easter) Candle and each year the font is re-hallowed with the Paschal Candle at the Easter Vigil on Holy Saturday. It is a powerful reminder that, in the early Church, baptisms principally took place the Easter Vigil, linking this sacrament of initiation to the paschal mystery of the dying and rising of Christ. The Paschal Candle is marked with the letters Alpha and Omega from the Greek alphabet and the date of the year, celebrating Christ as both the origin and consummation of creation, and it is marked with five incense grains recalling the precious marks of his crucifixion. It is through the cross and resurrection that humanity is drawn irresistibly back in love to the generous and inclusive heart of God. A candle, lit from the Paschal candle is given to each candidate on the occasion of their baptism, reminding them of our call to illuminate and transform the world with the brightness of God’s love. Baptism is the foundational sacrament of the Church and by it we become a member of Christ’s body, the Church, throughout the world. In baptism the decision is made to follow Christ and reject evil. For those unable to answer for themselves these promises are made on their behalf by their parents and godparents. Into the Body of Christ? 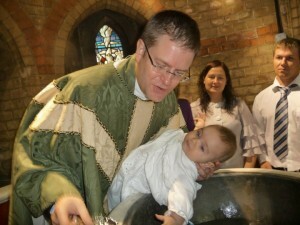 At Emmanuel baptisms take place in the main Sunday Eucharist, usually on the second Sunday of the month. Baptism takes place within the main service because all those present represent the wider body of God’s family, as they joyfully welcome a new member into this church community. Since baptism is about joining that wider family of the Church we do ask that you attend the main Sunday service for a couple of months before the Baptism. It is our aspiration that Emmanuel is a warm, welcoming and inclusive community and children are especially welcome at all our services. Baptism is open to everyone not previously baptised. Normally you should live within the parish of Emmanuel, although if you are a regular worshipper here but living outside the parish this may also be possible after talking to Fr Jonathan. How do I arrange a baptism at Emmanuel? You should first speak to Fr Jonathan or one of the other clergy who will give you a baptism application form – or you can download one from the bottom of this page. Adults considering baptism for themselves are also encouraged to consider Confirmation at the same time. Our annual Confirmation Eucharist at Emmanuel is usually around the Festival of Christ the King or during the season of Advent towards the end of the year and conducted by our Area Bishop of Edmonton. Sometimes parents of children being baptised have been baptised themselves but never confirmed. We would be delighted to discuss this further with you if you are interested. Godparents – who and how many? There are normally three godparents – two of the same gender as the child and one of the opposite. All godparents should themselves be baptised as they seek to support and encourage the child in the faith and make the promises on their behalf. Baptisms take place after the sermon during the main Sunday Eucharist when those to be baptised, together with their parents, godparents, family and friends gather round the font. Parents and Godparents make promises on behalf of the child, and the whole congregation also celebrates their own baptismal faith and their desire to welcome a new member into the family of the Church. The priest then blesses the water in the font before baptising the child/candidate ‘in the name of the Father and of the Son and of the Holy Spirit’. Special oils are during the baptism, which have been blessed by the Bishop of London during a special service on Maundy Thursday just before Easter each year. This reminds us that we are part of the wider church family. A small amount of the oil of catechumens is used earlier in the service, signifying the beginning of a journey or pilgrimage of faith. The oil of chrism is used straight after the baptism, signifying how special we are in the sight of God. Just as monarchs were anointed with oil in the Old Testament so are all people anointed in the Christian tradition to show that we are special and called to continue in the prophetic, priestly and royal ministry of Jesus Christ. A candle is given, lit from the large Paschal (Easter) Candle, calling to mind Christ’s rising from the dead and reminding us that we are to shine like lights in the world, just as Jesus commanded us to do. The service continues with the welcome and the sharing of the peace, symbolising the mutual love and fellowship which should be the hallmark of any Christian community. The focus of the service then moves to the altar where we share in the special meal of the family of God, before we are sent out to show God’s inclusive love and light to the world. Jesus tells us that our discipleship will cost everything and every aspect of our being – but in monetary terms the baptism is free and will cost you nothing! There will however be the opportunity to make a donation to the life and work of the Church during the service. If you have any further questions please do feel free to speak to one of the clergy. We very much look forward to welcoming you and your child as members of the family of God at Emmanuel. To link to the Church of England baptism site please click here.